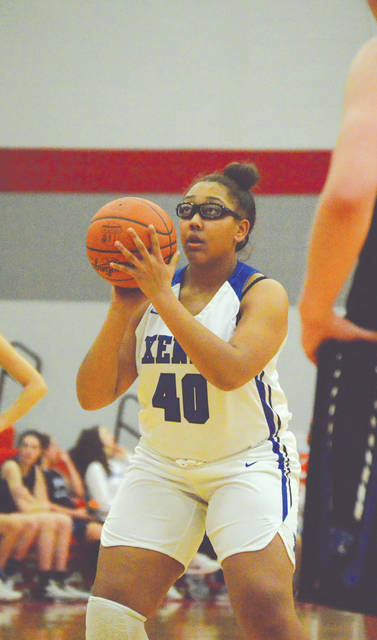 Trinity Morton-Nooks, Xenia’s leading scorer during the regular season, was double teamed throughout Wednesday’s Feb. 21 girls high school basketball game at Troy High School. Springboro defeated Xenia, 61-14 to advance in the Division I sectional tournament. Xenia’s Kamea Baker (5) puts up a three-point attempt in the first half of Wednesday’s Feb. 21 sectional semifinal game against Springboro. 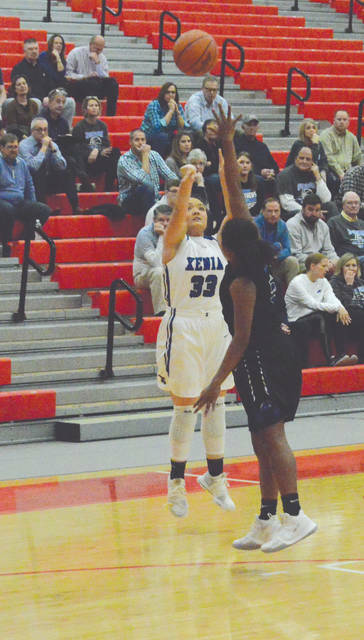 Baker led Xenia with six points scored in a 61-14 loss. The Buccaneers’ lone senior, Adri Winston looks for an open teammate in the first half of a Division I girls sectional semifinal game against Springboro, Feb. 21 at Troy High School. Xenia’s Alexis Claybaugh drives the baseline in Wednesday’s Feb. 21 Division I sectional semifinal basketball game. Springboro won the game, 61-14, in Troy. Kelli Hatfield (33) puts up a 3-point shot attempt over Springboro defender Kennedy Lewis, in the first half Feb. 21 at Troy High School. Helen James concentrates at the free-throw line in the Feb. 21 girls sectional tournament loss to Springboro, in a game played at Troy High School. 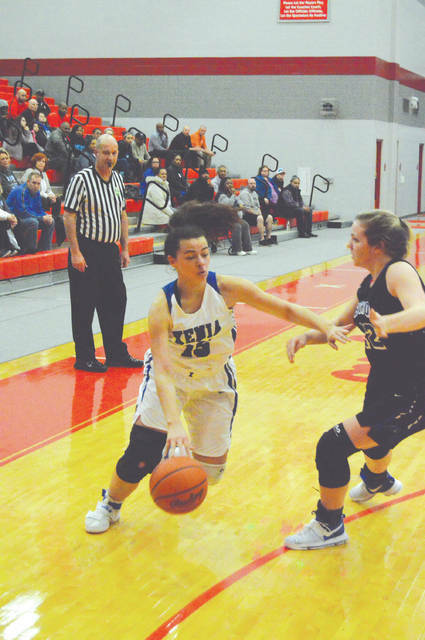 TROY — Everybody in the Troy High School gymnasium knew that Xenia’s girls team had the odds stacked against them. Going up against a talented senior-laden Springboro team is a challenge for anybody. 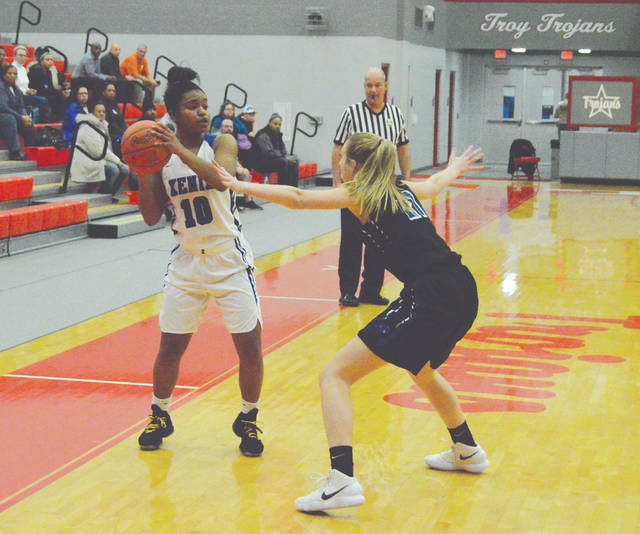 The second-seeded Panthers (21-9) won handily, 61-14, on Feb. 21 to advance to the Division I sectional finals while ending Xenia’s season with a 3-20 record. Springboro charged out to a 9-0 lead in the game’s first five minutes. With eight seniors on its roster, Springboro’s level of play never appeared to wane. With constant pressure on Xenia’s shots, and their consistent ability to swoop in with their taller inside post players for rebounds, the Panthers never seemed to let up against the over-matched Buccaneers. “I thought we did alright in the first half, until about the last minute and a half. 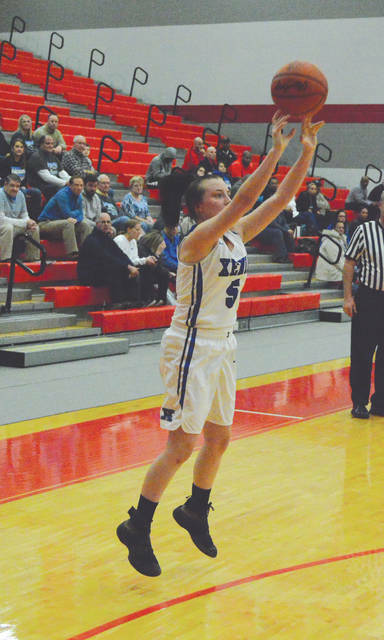 Then we got tired, and Springboro went out and scored about eight layups in a row against us,” Xenia coach Jamie Hand said. “Up until then, I thought we played as well as we could. We weren’t scoring a lot of points, but we were still running our offense, and we did a decent job on defense. Very unofficially, Springboro outrebounded Xenia 31-10 for the game. 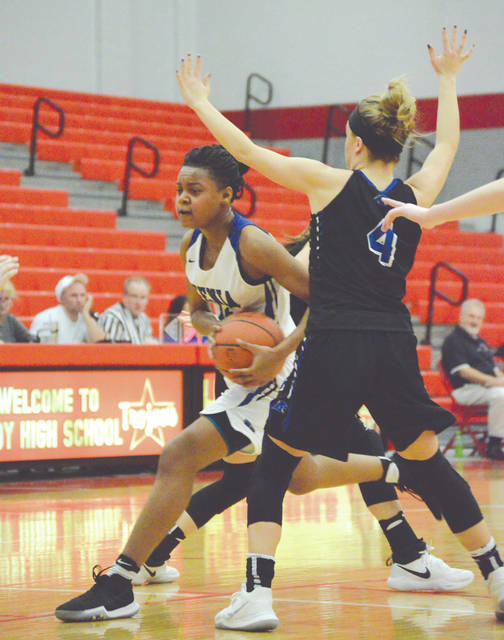 Trinity Morton-Nooks entered Wednesday’s sectional semifinal averaging a team-best 13.6 points per game, and Springboro seemed to know it. Morton-Nooks rarely got a clean look at the basket, and was limited to three points, all from the free throw line. Kamea Baker led the Bucs with six points scored, the team’s lone senior — Adri Winston — scored three points and Alexis Claybaugh finished with two. A running clock was implemented with five minutes yet to play in the third quarter, as the Panthers had rolled out to a 45-9 lead. Springboro outscored Xenia 23-0 in the third quarter. Jordan Diehl was the Panthers top scorer with 16 points, Lauren Thomas finished with nine points, while 10 other Springboro teammates accounted for the other 36 points. Springboro advances to play either fourth seeded Wayne or No. 10 seed Springboro in the sectional final. That contest is set for Monday, Feb. 26 at Troy High. The Panthers beat both teams handily during the regular season. Hand said he appreciated Winston’s play in her senior year for the team.